Remakes/reboots can be a hit-or-miss in the movie world. I tend to be on the fence before I see the final product - it's always good to have an open mind. However, if the original movie is a classic or near perfect, there are a lot of expectations set against it. The same can be said for the movie that I will be reviewing today. The film is the remake of the supernatural buddy comedy flick: Ghostbusters. The Plot: After being fired from their jobs for discussions of the paranormal, a rag tag group of friends open up a ghost-hunting business to prove the existence of the ghosts. However, when ghosts start to terrorize the city, it is up to them to save everyone. 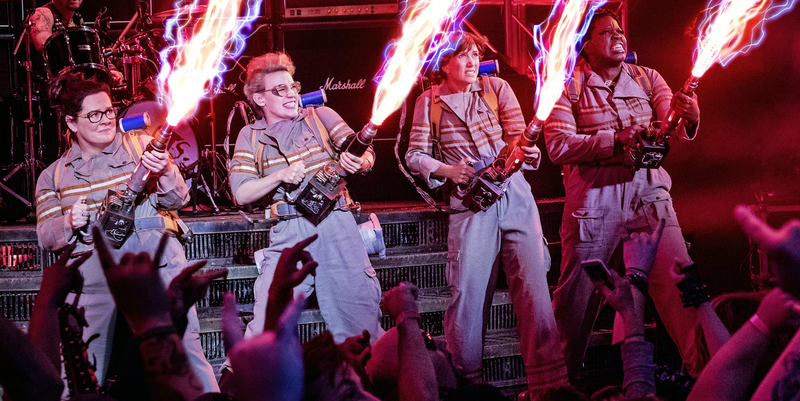 Ghostbusters isn't a bad movie; in fact, it's a good film and offers a few laughs. Kristen Wiig, Melissa McCarthy, Kate McKinnon and Leslie Jones all shine in their characters as the main four leading this adventure. And with these four, there were moments where I did genuinely laugh. The problem I have with Ghostbusters is simply that it was unnecessary. The movie didn't provide anything new to the series but explain the cause of these ghosts appearing in the city. The design and special effects detracted from the scariness of the ghosts and made them feel non-threatening whereas in the original, it felt more like a horror-comedy. When it came to the supporting or side characters, they were funny but didn't come across as real people; they were more as comedic pieces (especially the Chris Hemsworth character). Ghostbusters is a fun flick and I would suggest checking it out, but if there came a choice between watching this film or the original, you should absolutely watch the original.